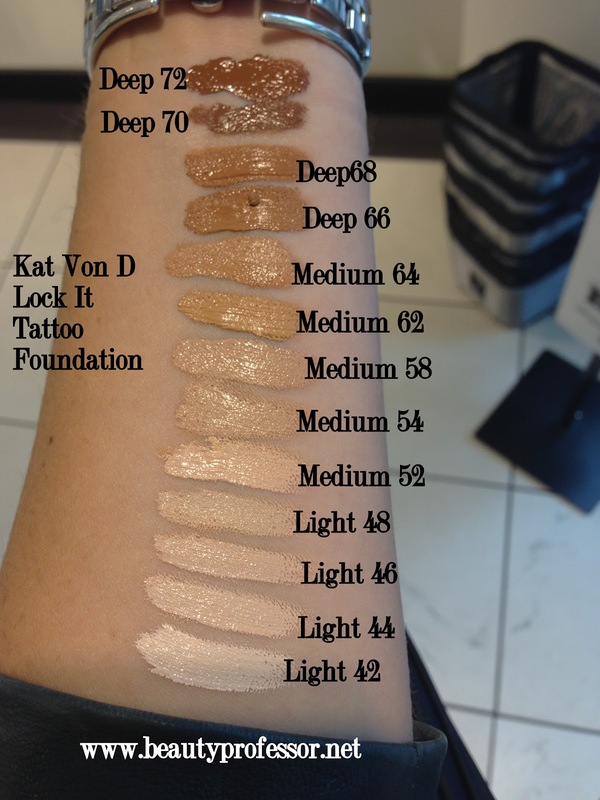 Beauty Professor: Kat Von D Lock It Tattoo Foundation...Swatches of All Shades! During my trip to Seattle last week (full recap to come! ), I managed to swatch every shade (with the exception of #56, which was mysteriously missing) of the Kat Von D Lock It Tattoo Foundation. Since posting my review on this foundation last August, I've received a myriad of questions from readers hoping to find their perfect shade...in turn, I hope this post is useful, especially for those who need to order this formula (which, by the way, is extremely full coverage and long wearing) online! Above: Swatches outdoors in the shade. Above: Close up of the lighter shades. Above: Close up of the medium and deep shades. Nice review and a great scope of foundation shades! I would like to try Kat Von D cosmetics! Thank you, Makeup DeMon! If you are looking for cosmetics with extreme coverage and lasting power, then Kat Von D might be the solution! Thank you sooo much for going to the effort of doing the swatches on your arm. I bought ( pre owned) light 48, in the bright daylight it looks ok..Even though it's darker than my face. But when I was in a changing room in town I saw an obvious line and when I got home I looked like I had rubbed an OXO cube on my face like they did for fake stockings during the war, lol. I am not sure if I will buy it again, I thought it definately covered broken veins and my redness on my chin which is great to not need concealer too. But I found it sooo thick and hard to blend ( but I always use my finger). I think I would try this with some light moisturiser ? I also didn't like how it showed lines when I tested pulling faces , it showed how thick and cakey it was. I wanted to sell it , but who wants 3rd hand make up? I admit it looked flawless in photos especially, though I thought the coverage was a bit patchy but it might be cause I didn't apply with a blender or brush? If it was £5 -10 cheaper I might get it again but as it again would be a slight guess at the colour ( even with your help :) ) I think I will stick to one I can buy in the UK from a shop. I'd give it 7-10. Sorry this was a long post , lol. My pleasure! Because this foundation is so opaque, I guess a spot on match is essential...I wouldn't call it a forgiving formula if it is a bit off (like By Terry Sheer Expert). When I use this (which is fairly rare at this point since I am leaning toward medium-full rather than completely full coverage foundation as much as possible), I have to apply it over a primer (LMdB Peau Vierge) and blend like crazy! You are right...the way it photographs is beautiful, but it is more of a "specific purpose" foundation for me rather than an everyday choice. I hope you have a lovely weekend...xoxo and keep in touch! Thank you so much, Anon! I am honored by your compliment...so sweet! Thanks for the swatches I love your blog!!! My pleasure, Anon...thanks so much!!! Please, would you tell the colour/brand of lipstick that you're wearing?! Perfect peach, looks gorgeous on you. Thanks so much for your question and compliment! I am wearing YSL Rouge Volupte in Faubourg Peach ; ) Very pale, very peach, very opaque! This foundation blows away every other foundation I've ever tried by a long shot. I absolutely love it, and I don't know if I can find one fault with it. I apply with a damp beauty blender, blotting product over face and neck. I find that application of the foundation is so easy, and sits on my skin so nicely. Every foundation I've tried till now collects in and always seemed to emphasize pores and fine lines regardless of application technique. Being a guy that uses makeup, I have to have something that looks as natural as it possibly can while still providing a good coverage. I was very skeptical about trying this foundation as I've tried many higher end products that just never seemed to live up to the hype, but this exceeded how I thought a foundation could ever perform. Truly, the only thing I could possibly fault this foundation for, as weird as it sounds, is that it makes my skin look too good, too flawless, which can end up looking odd on a male depending on the desired finish. I can't praise this product enough, nothing comes close, I will repurchase again and again. the 42 is white pink? because, im very verywhite but understone pink. the white yellow is very ugly for my face. Thank you for the question...yes, the #42 does have a pink undertone. It is extremely light and doesn't have any yellow! hello, can you please recommend me a shade for this? ive used nars deauville , its a balance of yellow and pink undertones. i have blueish / purple veins so im guessing im cool tined.. im fair/light with natural medium brown hair and brown eyes. I am guessing you could get away with Light 44 (on the lighter side) or Light 48 (a shade darker) based on your current NARS match. Thank you so much Beauty Professor! They don't seem to sell this at any stores in Melbourne (that I know of) so I was thinking of ordering it online and your colour swatches and descriptions were very helpful. So happy to hear it was helpful for you...I appreciate the positive feedback! Hi there (: I'm an Nc 40-42 in Mac studio fix fluid . i am curious as to which shade would best suit me . Please help! Thank you! I am guessing that Medium 62 would be a good match for NC 40 or so! Thanks for the swatches, I was wondering if any of the medium-deep shades have a more olive undertone? 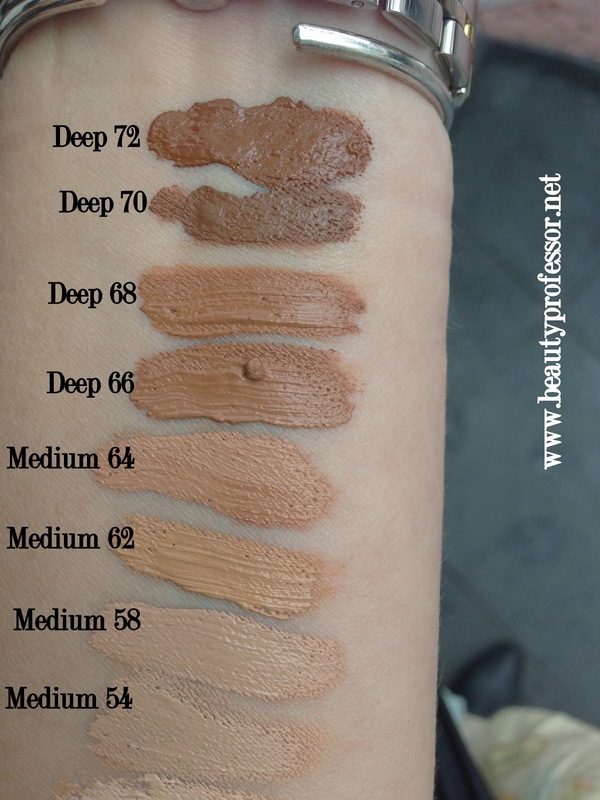 It seems that Medium 62 and Deep 66 have relatively olive/golden undertones. I purchased the m52 and it is so yellow on me! The Pantone matched me at this- I have very pink under tones and I like to tone them down but not look yellow. I am between light and medium and have a few freckles. What shade should I exchange my foundation for? Thanks for your question...the only shade with more neutral undertones near your current shade match is Medium 48, which has beige (more neutral) rather than yellow undertones. That's my best suggestion...take care and hope that helps! Hello (: what shade would you recommend for yellow undertones with red overtones? I got matched at MAC but she gave me my color for the winter which is NC15. I tried light 45 but it was way too light. Please help! Much appreciated! Thanks for your question...that's a tough one. If you were matched to NC 15, you are quite fair with warm undertones. In turn, I am surprised that Light 45 was much too light. I would suggest Light 44 but it is probably too light as well?! 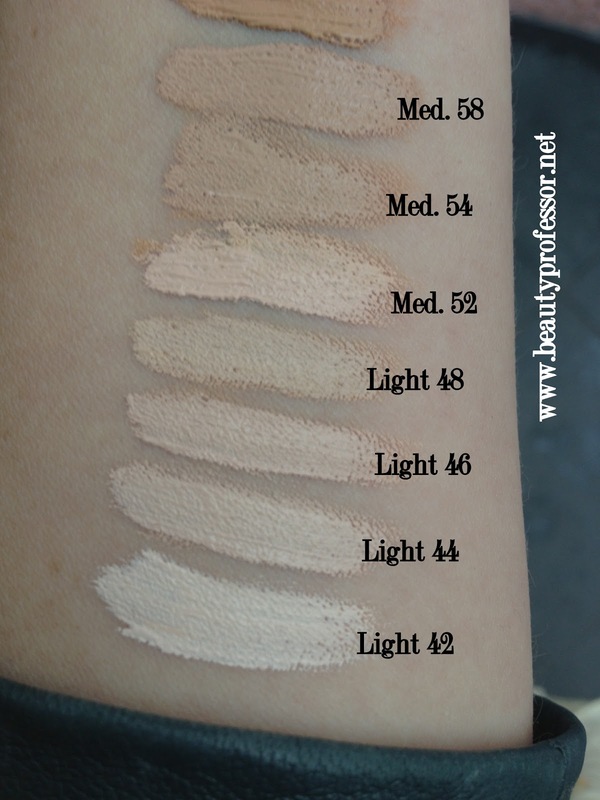 The next logical step up from Light 45 is Light 48...it is more for light to medium skin tones but perhaps it will give you the effect you want. HI there! i was thinking of buying this online because i dont think they sell this here in Australia.. im currently a nc35 with the mac prolong wear but its going to be summer soon.. what shade would you recommend? Based on your current match in Mac, I am guessing that you would be Medium 54 in the winter/spring and Medium 62 in the summer (when you are your tannest). There is quite a jump between the two but no reasonable yellow based shade in between. It's up to you! Hey :) Uso a base studio fix fluid da MAC na cor NW20, qual cor da Base Lock it eu devo comprar ? Qual ficaria melhor com o meu tom de pele? I suggest Light 46 (light with pink undertones) or Light 48 (a bit darker and more neutral). I believe in Mac I am a NC20-25 what shade would do best for me? I am more yellow than pink, pink looks dark on me especially in comparison to my neck, but sometimes yellow makes me look sallow. I have green veins, I am fair. I suggest Light 48...hope that helps! I am very interested in this foundation after so much reviews and youtube. My only issue is I'm not sure which color is right for me. I am a nc37 and a c4 with mac. What color would you recommend? I suggest taking a peek at Medium 54 (on the lighter side) or Medium 62 (on the darker side). Would you happen to know if there's a difference between the deep 70 and deep 71? So sorry, Anon...I swatched these before 71 was released and it doesn't seem like Deep 70 is even available anymore. It jumps for D68 to D71 on the Sephora website, so my best guess is D70 and D71 are very similar! I suggest following up with Sephora to confirm though, just in case! Thank you so much for this review.I would like to know if im using MAC NC40, which shade is mostly suits my skin for this foundation? I suggest Medium 62 for your skintone...hope that helps! Hello! I love what you people say about this foundation but i don't know which shade is better for me. I can't go in Sephora and try it because they don't have in my country (Romania). I usually use mac nw15 and after looking at this photos I think I would need light 44 or light 46. Could you please give me an advice? I want to order it online. Thanks for your help and congratulations for what you're doing with this blog. You are really helping people around. Thanks for your kind comment! You are correct in thinking that you would be Light 44 or Light 46...Light 44 is very close to NW10 and Light 46 is close to a NW 15, so I would suggest the Light 46. Thank you very much! It really helps! I owe you big time! I'll write you after I try it! I recently went and tried this at Sephora and bought light 44. Light 44 and light 46 are VERY similar, light 46 being maybe a hair darker in color, but hard to tell the difference. So far I LOVE this foundation! 2 coats under my eyes has replaced the need for concealer, WOW! My one tiny complaint is you do need to really moisturize because this stuff will highlight any dry patches. Also as far as shade goes in some lights light 44 looks slightly yellowish, I never tried the lightest shade, light 42, but I'm wondering if that would have been worth a try. In any case I LOVE it. I have tons of broken capillaries, hence my need for very full coverage, and with this product they are invisible! Thanks for sharing, Vanessa! I appreciate the details of your experience and know other readers will benefit! I am a 40 in MUFE mat velvet and 60 in the winter? I have olive skin. What colour do you think would be best for me? Also, I have very oily skin, do you recommend kvd lock it or immaculate hourglass? Thanks for the question...I actually recommend the Hourglass Immaculate in Beige (I have swatches on my blog!). It is excellent for very oily skin and I prefer the ingredients of the Hourglass to that of the Kat Von D.
I use to be NC42 in MAC Studio Fix Fluid but actually is a little too yellow/orange (maybe I need some of sun LOL). I wanna try the NC40 in Pro Longwear but the coverage of Kat Von D foundation looks much better... In your opinion which have fullest coverage between this two? I don't know if my right shade is M54 or M62... I´m afraid if this oxidize some, much or nothing. Oxidize? Thanks for the comment, all the way from Panama ; ) I actually haven't tried the MAC Pro Longwear so I cannot compare it to the Kat Von D. I will say that the Kat Von D offers more coverage than most foundations on the market, however! This doesn't really oxidize (at least on my skin), so I suggest getting the shade that is closest to your current shade now! There is a new shade medium 53 in this foundation, do you know if that is darker or lighter than Medium 54, and what color characteristics? I have the medium 53, but I am thinking the medium 54 might be a better match? Thanks for your question...I wish I could answer it with certainty, but I haven't swatched the new shade. I am guessing it would be lighter, just because the shades tend to get darker as the numbers get higher. However, I don't want to say for certain. Thanks for the question...I actually have't seen #71 in person, but I am guessing that if #70 isn't available, that #71 is the reasonable replacement. i am nw25 in mac what would you suggest i kvd? i have the light 49 but i guess they dont make it any more? i think it was a little light for me ,i have pink undertones. If the Light 49 was a bit light for you, then I would suggest the Medium 52...it is light beige with pink undertones! Hi beauty professor, thank you so much for this post I wear NC 45 studio fix mac, please can you suggest a shade for me thank you in advance. Love all the way from Canada lolz! Thanks for your comment and love from Canada...I would suggest Medium 62 (on the lighter side) or Dark 66 (on the darker side) as potential shade matches! Thanks so much for this post! Clarified much about the color palette. And congratulations, your blog is wonderful. My pleasure and thank you so much...so happy this post was helpful for you! I recently went to Sephora to purchase the Kat Von D foundation, I even got one of the makeup artist to help me out because i wasn't sure what shade, she applied Medium 54 and it looked great and she thought so too, so I purchased it! I used it about 3-4 times until one day i was outside with a mirror and noticed that it was definitely much more darker than my neck and chest! My whole life I've been using Ivory 5 Mary Kay TimeWise Luminous-Wear liquid foundation it's my perfect shade. What shade would I be in the Kat Von D Foundations? I am guessing that Light 48 would be your next best match...it is a light warm beige and will be a step in the right direction for you if Medium 54 is too dark. If M58 was too pink for you, then I would get M54, which as neutral to yellow tones and is close in depth to M58! Hi I really want to get this foundation but need help in picking my shade. I am in shade 123 for Make up forever HD foundation. Thanks so much! Great blog! I would suggest Medium 54! Thanks for the kind words and hope that helps! I really like your blog! I currently use Lancome Teint Miracle in Buff 6(W). I want to try a foundation with a fuller coverage and it looks like Kat Von D may be an option. The Lancome Buff 6(W) is a perfect color match for me. Do you have a suggested color that is comparable? Also, I'm thinking I might want to try and use a primer. Any suggestion on what primer to use under the foundation? Thanks!!! Thank you! I am guessing that Light 48 or Medium 52 could be good options for you! In terms of primer, I highly suggest the Hourglass Veil Primer...one of my favorites! Hello and thanks! I would suggest Medium 54 or M 58 (if you plan on getting tan as summer approaches). I am honey beige n6 in loreal true match which it is a little dark for me but i want to have the right shade of Kat Von D and i am guessing maybe medium 56.... what do you suggest? I am guessing that Medium 56 or Medium 58 will work! Thanks for your prompt answer, great blog!! i have light skin, not sure what my undertone hope you can help with that. I have been using Lock it light 46 but it comes a bit yellowish, same with light 44. Someone suggested I should try light 45 but of course, it is out of stock at the moment. - i am trying to find a primer which would not slide the foundation down, would even my skin tone and would be suitable to wear with the lock it. Any advice would be much appreciated. Thank you thank you. Hello and thanks for your question. I suggest the Hourglass Mineral Veil Primer as a companion to the Lock-It. It is light and nourishing and keeps foundation in place! I love it for sensitive skin, which I have as well. I, too, would suggest the Light 45 as a slightly darker option; there is also Medium 52 which isn't as dark as it sounds! Thanks for the question...Based on your MUFE match, I would suggest Medium 52! It is a light beige with warmer, yellow undertones like the MUFE 35. Thank you for the swatches! I would love to buy this foundation but I would have to get it online as it doesn't sell in Ireland. I use Estée Lauder double wear dessert beige, do u know what shade would best match it? And also a concealer match? Thanks for the question; I would recommend Light 48! Hello iv used this foundation in light 46 but it was a little bit too dark I tried light 45 and looked orange what color would u suggest? I would try the more neutral Light #44! Hi Im trying to purchase KVD but they dont have any in Australia so I have asked a friend to bring some back from her travels. It seems you are the only person willing to help with conversions and I thank you very much for your help and time to people. You are a blessing. I use a Mac NW25 which is a bit dark for me (summer time use) and Estee Lauder Double wear 2NI Desert beige 12 (fraction too light). I would be great if I could find a KVD that goes in between. Can you help me The Beauty Professor please please please xoxoxox. Hello...thanks for your kind words...I am happy to give it my best shot ; ) I am thinking that you will find a good match with Medium 56 (on the lighter side) or Medium 58 (a touch darker and rosier). This foundation does have remarkable lasting power but since I've never tried wearing it in Nigeria, I'd be hesitant to promise 24 hour staying power. In terms of a color match, I would suggest Medium 64 or Deep 66! Hi there! I was wondering if you could help me out with picking out a shade. I'm currently using MAC Studio Fix Fluid in NW10. I think you could get away with Light 42 (on the light side) and Light 44 (a touch darker and more neutral...probably great for summer). Hello :) im going to purchase this foundation but having trouble getting my shade right. I was matched a mac nc 30 and nars stromboli although I still find them slightly dark. And I have a yellowish undertone. I would suggest Medium 54 in light of your current color matches! Thank you for posting the swatches. You've been so helpful to everyone! I am having trouble deciding if I am wearing the right shade of this foundation. I have light skin with pink undertones. I am a NW15/NW20 in MAC, and a 115 Ivory in Make Up Forever's HD Invisible cover foundation. In light of your current experience, I would stick with the Light 44 and just "rosy it up" with some blush. I think that Light 42 will be too light and it sounds like you've already ruled out Light 46 as too dark. Hi. I currently use Light 48 but was thinking of trying the Hourglass Immaculate foundation you reviewed. Do you think the Shell or Golden would look ok? I would recommend Shell as I think Golden will be too dark! Can you please help me find a shade for my skin tone? I am a 60 in the MUF Mat Velvut + and I have neutral undertones. I would suggest Medium 62! I am currently using medium 52 but I feel like it is a bit too light since I have gotten some tan this summer. What color do you suggest I go up to for summer? If you only need a bit more depth, then I would bump up to the Medium 54. I would suggest Deep 66 (on the lighter side) or Deep 70 (on the darker side). I would suggest Light 46! Hello...I would suggest Medium 56 or Medium 58! Hey! I'm just wondering, I'm a NW 15 in MAC studio fix, what shade would I be in the kat von d? recently discovered your blog, as well as the Kat von d foundation. I'm so unsure on the perfect color for me, so I was hoping you could help. I'm light/medium more neutral than anything. Green veins but very close to blue as well. I'm very confused on the right shade. I'm leaning toward a light 48 to medium 52. Please help lol I also don't want orangey color. 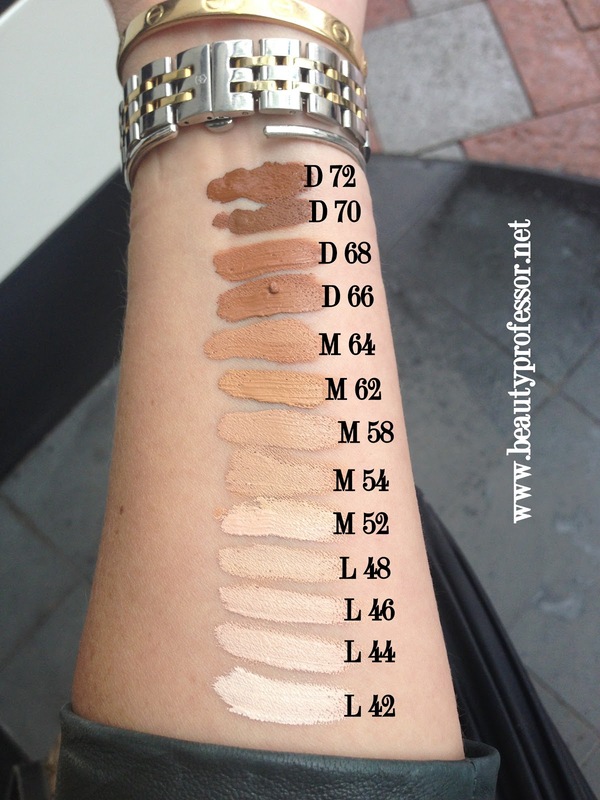 I would recommend the Light 48 as it is very neutral! I recommend Light 48 or Medium 52! I have correct match with Koh Gen Do Maifanshi Aqua Foundation in 213 dan Chanel CC Cream in 20 Beige. I have yellow undertone, but okay with a little pinkish in foundie, but way too yellow will give me sallow and heavy and way too pink will be unnatural andd very make up look. Based on what you have told me, I suggest light 48! It is a good neutral beige and similar to the KGD 213...if it is a touch too dark, you can mix a bit of the KGD in to sheer it out a bit! Hi, I know this is an old post I hope you see this! I've just discovered this foundation but they don't sell it in Australia so I'm trying to figure out my shade to order. I just and a couple of questions. 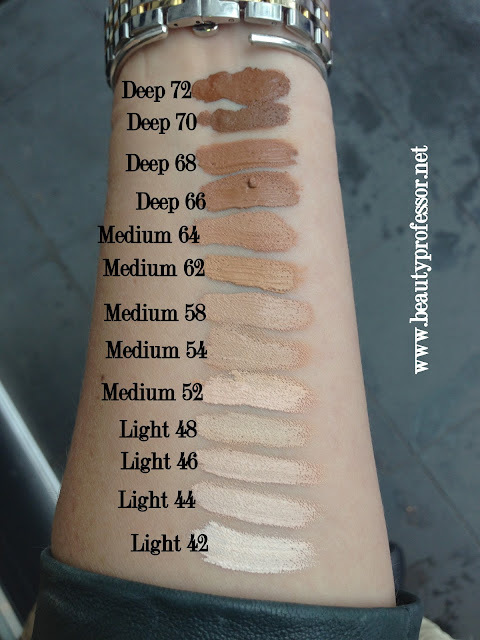 First of all medium 52 looks lighter than light 48 in the swatches, do they blend differently? If that makes sense. I'm probably around the same shade of skin as you so I'm thinking medium 52, but it looks very light in the swatches. Also, do you think I would be able to mix a bit of another foundation to get the right colour if I order the wrong one? I've done this in the past because my skin seems to have a funny tone that isn't really matched by any brand. But I'm not sure if you can mix all foundations. I would recommend Medium 52 if you are the same shade as me! I have also mixed this with other foundations to get the perfect match...definitely do-able! Your site has been so helpful to me when researching which products to get for myself. I'm in Australia and also am having family bring this product to me, but am having stresses about the color match. This is my first foray into liquid foundation, so I want to get it right (especially with such a pigmented product). I am a fairer-skinned Filipino with yellow undertones who normally tans under the sun (which I avoid as much as possible), so my complexion is fairer than most Southeast asians. The most perfect matches for me are the Mac Studio Fix Foundation Powder in C4, and the Shiseido Natural Finish Cream concealer in 3 Medium. The next best match is the MAC Pro Longwear concealer in NC30. Other brands I use are Chanel Mat Lumiere in 80 Contour (which is a smidge too dark and "pink" on me) and Smashbox CC cream in Light/Medium (if I am expected to go into the sun - this makes my face look more "tanned" than my decolletage). Also, I tend to oxidize my concealers, so I assume that my skin would oxidize Kat's foundation too - should I then opt for a lighter shade? Does oxidizing "neutralize" the warmer undertones and make it more yellow/golden? So far in my research, I've narrowed to the shades 48, 52 and 54 (although I think 54 may be too dark for me). When I asked Sephora myself, they were rather unhelpful by telling me that I still have to come in store to swatch it myself, despite my informing them that I am far from local! So you're my last hope! Thanks for the kind and detailed comment! I suggest shade Medium #52...the formula does oxidize slightly! What do you think suits me the makeup sponge bmhint undecided between 52 and 54 have a pink tinge, but yellow. I suggest Medium 52...it is very close to MAC NC 25! Hi, I use NW 43 in mac. what color of sephora foundation is right for me? Thank you in advance. I currently use Bare Minerals powder foundation in Fairly Light. I have rosacea and thought the Tattoo Lock would be a great choice for coverage. Any suggestion for shade choice? My closest Sephora is 1.5 hours away so I will be ordering online! Thanks for the question. I suggest Light 48 or Medium 52! Where I live we don't have a sephora close, so i am going to order online. I use ivory 5 in mary kay timewise, porcelain ivory light 1 in maybelline dream matte mousse and I can use 180 sand beige or 220 in revlon colorstay! Please help me with a suggestion to the colour of this foundation! Thanks for the question. I would suggest Light 49 or Medium 52! Hello...thanks for the kind words. I suggest Medium 56 or Medium 62 (which has those yellow undertones you mentioned!). You are so kind & compassionate, replying to every comment on here with your helpful answers :) can you suggest if I am a 46/48 or 52, I wear a MAC NC20/25.. Do you have a youtube channel? Thanks! I suggest Medium 52 if you're closest to NC 25! Hi I currently use 120 soft sand in make up forever. It is a slight bit yellow on me but I like to use it to cover redness. My skin is very sensitive and can be oily and dry depending on the season. Would you recommend this foundation or something else for my skin? And what color? This has worked well for many of my readers with sensitive, oily skin...it is opaque but controls oil well! I suggest Medium 52. I want to purchase this foundation but am not sure what colour to try as a sample. I currently use mac nc45 and have uneven skin tone. Please could you help? Thank you. Hi! I wear MAC in NW13, what would you recommend? Do you think 42 is too light? I would go with Light 44! The KVD foundation is much more pigmented than the Smashbox CC cream you've been using so it could just be that you accidentally used a bit too much...either that, or the formula oxidized on your skin (some formulas do this more than others on my skin as well!). I would add a dash of your Smashbox with the KVD to see if the mix corrects things! Thank you! I appreciate the suggestion! I'll give that a shot! Light 48 or Medium 52 could be two good options! What shade are you wearing in this pic? I wear Medium 52...it is about NC 25 so going a step up to M54 should probably be OK! Hi i use mac nw30 when i go out its a bit dark on me, what shade would suit im struggling to pick one! Im pale with blonde hair and have no idea if im pink or yellow toned!! Typical irish skin! Great post! i'm looking for advice – KVD is so unavailable in middle europe, but i found one and now i'm wondering: usually my skin tone is about Revlon Colorstay 110+150 (110 is too light, 150 too dark, so i mix them together) and here is my question – can you compare somehow KVD 42/44 light with Revlon Colorstay 110/150? i mean can you show some swatches, oooor (!) maybe you can compare it with Loreal True Match N1, cause it also was kind of fine one? Thanks for the kind comment...I try to be as helpful as I can to my readers ; ) That being said, I don't have the Revelon and Loreal shades you mention to be able to swatch against the KVD. So sorry! I wish you the best in your foundation pursuits! My perfect foundation matches are Mufe HD 120, Nars Sheer Glow Ceylan and Marc Jacobs 29. I tried KVD Lock-It in Light 48 and it was a tiny tad too light and too greyish on me and washed me out. then I tried Medium 52 and it was a tiny tad dark and it's too yellow. Where should I go from here? Maybe 49? 45? 46? Thank you so much for your review and your help! Ahh...that's tough...I haven't swatched 49 but I would think that 45 and 46 would be too light. I wish you the best in your search and thanks for the kind words! I suggest Light 44 or Light 48 (on the darker side)! I am not very good at choosing the right shade of foundation for myself. I went to MAC in Bloomingdales and the woman matched me with the MAC Studio Face and Body Foundation in the shade C3. I don't see much coverage with it, it seems very light. I want my freckles covered and it does not do the job. Which shade would you recommend? I would recommend Light 48 as closest to MAC C3...you will definitely get coverage with this formula! I've always bought "medium" colors, Benefits "Champagne" color matched my face flawlessly, & I used to purchase Medium in Bare Minerals. I am not sure which shade to pick! I have light brown hair, blue eyes, tan well, etc lol. Anything can help. Thank you!! Thanks for the question; I am guessing that Medium 54 should be a good match! Thanks for the question...I know, sometimes it can be overwhelming to go into a store to be matched! That being said, I am guessing that Medium 54 would be your closet match. Hi, I'm super late to this post but as of today Sephora ships to NZ and I'm dying to get this foundation but no idea which shade would be best? Rimmel lasting finish: 100 ivory. I would recommend Light 44 (on the lighter side) or Light 48 (on the darker side). I hope that helps! I would recommend Light 46! Hello! I'm from Taiwan and it's difficult to get a hold of lots of brands here. Your site has been like a super guardian angel! Thank you so much for all of your detailed swatches and descriptions, they have really helped me out countless times! I do have a question about finding a shade for this foundation! I am 117 in MUFE Ultra HD but it's a bit light on me, B30 in YSL, and a 3.5-4 in Armani. My skin is yellow-toned. Would L48 or M53 be a good match? Thanks for the sweet compliment...so glad you've found my site to be helpful! With reards to yoru question, I would suggest Light 48! Hi thank you so much for your write up and pictures! Very helpful!!! Just wondering if you could suggest a shade for me? I am sand beige in revlon was thinking shades 44 or 46 what do you think would match me better? I just recently discovered your blogs and I find your articles helpful and interesting. I have been thinking of trying the KVD Foundation but unfortunately it is not being sold locally in the Philippines (not even Sephora.ph). I hope you can help me find my shade. I am currently using Mac NC35 FOUNDATION, Mufe HD 128, Born This Way Warm Beige, Laura Mercier Candleglow in Linen and Chanel Perfection Lumiere Velvet in shade Beige. What will be the best ahade that you wpuld recommend. Thank you and Cheers to more success! I would suggest Medium 58 or Medium 62! Hello, I love you blog and I am really hoping you can help me. I am light 49 in KVD and its a perfect match for me. I have been wearing it since it came out but I would really like to try Mac. Can you tell me what shade I would be in Mac? The closest Mac store is 3 hours away. You are my last hope. Thanks! Thanks for the kind words...I would suggest NC 30! Thank you for your insights and recommendations. I wear MAC Studio Fix Fluid NW30 mainly and occasionally NW25. I also live out of the US and have friends bring me "care" packages whenever. I believed that my MAC foundation was described as having pink undertones, however I am confused as to which KVD would be ideal matches. Can you guide me? Hello! I would recommend Medium 58 as your closest match based on the details you've provided.